WBO world middleweight king Billy Joe Saunders has reiterated his desire to unify the division and offered “cheat” Saul ‘Canelo’ Alvarez some diet tips. 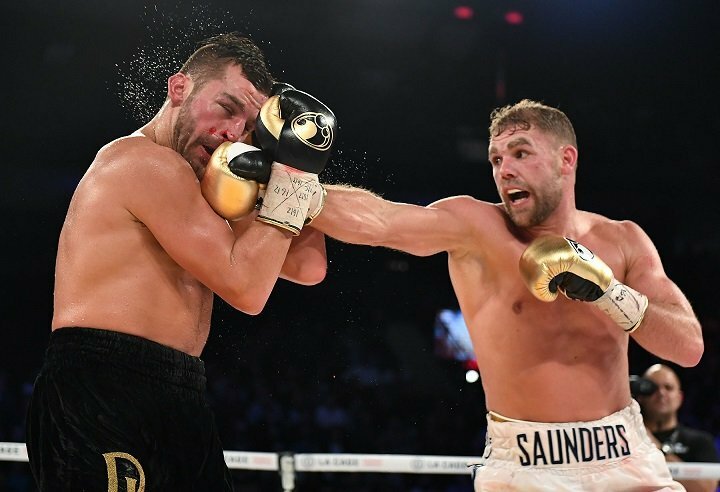 Saunders (26-0-KO12) is recovering from the hand injury that forced him to delay a defence against Martin Murray until June 23 but remains determined to earn his showdown with WBA Super, WBC and IBF champion Gennady Golovkin this year. Promoter Frank Warren has confirmed that talks are in progress for WBO Middleweight World Champion Billy Joe Saunders to face WBA, WBC and IBF Champion Gennady Golovkin in the autumn, should he come through his fight with Martin Murray at London’s 02 Arena on June 23rd. Golovkin was due to fight Saul ‘Canelo’ Alvarez on May 5th in Las Vegas, but the Mexican withdrew from the rematch on Tuesday, causing widespread rumors that Saunders would step in as a late replacement. However, Saunders’ promoter has confirmed that the undefeated Hatfield star will make the fourth defence of his World Title against domestic rival Murray on June 23rd as originally planned. “I’ve spoken with Golovkin’s promoter Tom Loeffler and Golovkin v Saunders is in play for this Autumn,” said Warren. “May 5th was never going to happen because of Bill’s hand injury and Golovkin’s team are going ahead with a fight on that date so couldn’t make a fight in June. “Bill will definitely be defending his belt against Martin Murray on June 23rd. “If he comes through his fight against Martin then we are hoping he will get the chance to unify the Middleweight division against Golovkin in the autumn. That would be a huge fight and one we would love to make here in the UK. “Golovkin has said many times that he wants to add the WBO belt to his collection and it’s a fight that Bill would jump at. There should be no problem making it – on paper it is a brilliant fight and one fans have been calling for. Tickets for Saunders v Murray priced form £40 (Tier) to £300 (Hospitality) are available to purchase via www.axs.com.